Patricia Briggs is the #1 New York Times bestselling author of the Mercy Thompson series, which includes Moon Called, Blood Bound, Iron Kissed, Bone Crossed, and Silver Borne. She's also written a spin-off series called Alpha and Omega. Her urban fantasy includes shapeshifters, werewolves, and vampires. Matthew Peterson: My next guest is Patricia Briggs, #1 New York Times best-selling author of the Mercy Thompson and the Alpha and Omega series. Thanks so much for being on the show today Patty. Patricia Briggs: Well, thank you for asking me. Matthew Peterson: So, Patty, your Mercy Thompson series has become really popular lately, so popular in fact that I hear that your publisher is going to publish your first book in the series again? Patricia Briggs: That’s what I hear too. They’re going to re-publish Moon Called in hard cover. Matthew Peterson: In hard cover. So that’s got to be a good feeling. I mean, that doesn’t happen very often, does it? Patricia Briggs: No! It’s really cool. Patricia Briggs: Well, I think that they’ve had a lot of people whining. There are a lot of people out there who like to keep their book series on the shelf together and they like them to look alike. And so when Bone Crossed came out in hard cover, they had a lot of people whining about the fact that they either had to wait until the paperback came out or they would not be able to have their series look alike. And I think this is a direct result of that. Matthew Peterson: Oh, okay. So, give us a little summary of the Mercy Thompson series. It’s a very interesting thing with werewolves and all sorts of different supernatural creatures. Tell us a little bit about the Mercy Thompson series. Patricia Briggs: Well, it’s set in around Mercy herself, who is a shape shifter. When I was originally asked to write this--well, it’s not paranormal romance; it’s an urban fantasy, which is a slightly different critter. When they asked me to do that, they wanted something with werewolves and vampires and a person with a complicated love life who is not necessarily a werewolf or a vampire herself but part of the supernatural world. And I like to write underpowered characters, and I’m partial to werewolves over vampires, although vampires are cool too. Patricia Briggs: So I thought, “Okay, well I want somebody sort of maybe tied tighter to the werewolf world and somebody underpowered.” And, you know, coming from the Northwest, immediately coyote came up. And once I made that determination, then of course a lot of other things came. I needed a real career to sink her teeth into, so to speak, because urban fantasy works best when it feels like the real world with just a kick. So Mercy is a woman who is a mechanic, who works in the Tri-city and just happens to be a coyote shape shifter. And she ties. . . at the beginning of the series, they’re broken ties, but they’re ties with the werewolf community because the mechanic who took her in and taught her what she was doing is fae. She also has ties in the fae community. And in the Tri-cities of my world, the vampires act sort of like the maffia, and if you are a member of the supernatural community then you have to pay them protection money so that they don’t come and take you out. And Mercy’s protection money is that she repairs the vehicles for the local vampires, which ties her in with the vampires. And so here I have this poor, not wimpy, but powerless, pretty much. Her super power is she turns into a 35 lb. coyote. Matthew Peterson: [laughs] Yeah, I mean, I’ve had coyotes go in my front yard before, I live in Arizona, so . . .
Patricia Briggs: Yeah, you know. . .
Matthew Peterson: . . . I know exactly what you’re talking about. Patricia Briggs: They’re cool, and they’re pretty quick, but they’re not all that big. Matthew Peterson: Yeah, yeah, they are. Patricia Briggs: And her real secret to survival is that, like the coyote, she blends very well. And she is very adaptable to her environment. And she does whatever she needs to do to survive. Coyotes are very admirable critters. They run in packs if they have to, if that’s how they get their food, they’ll run in packs, or they’ll hunt on their own. Matthew Peterson: [laughs] Yeah, yeah. Well, that’s very interesting. In this world, the supernatural is integrated into society? It’s not like a hidden secret, thing, that nobody knows about? Patricia Briggs: Well, some parts are. They sort of have given, you know, The Princess Bride, the good parts version; they’ve given the public the good parts version. So they know about the fae, and that happened maybe 25-35 years before the start of the series. The fae came out. And they had to because modern forensics had finally gotten to the point where they couldn’t successfully hide anymore. Matthew Peterson: [laughs] Yeah, yeah. Patricia Briggs: And sort of after the first book, after Moon Called, the werewolves have come out too, for similar reasons. The werewolves are run in the North America by the Marrok who takes his name from a werewolf who belonged to King Arthur’s court. And he is aware that the wrong people know about werewolves and people are getting blackmailed to get into special ops in military. And bad people know about them too, and he figures that the safest thing to do is come out to the public and then they won’t have any blackmail material. Patricia Briggs: Yeah, I try not to. Sometimes it works a little bit the opposite way, in that, I think Bone Crossed, you really have to read Iron Kissed first to get the full impact of Bone Crossed, just because in Bone Crossed you’re dealing with some of the fallout from Iron Kissed. Other than that, they’re pretty stand alone. And you shouldn’t feel at the end of Iron Kissed that you need to read the next book. Matthew Peterson: Yeah. Of course you want to read the next book, but . 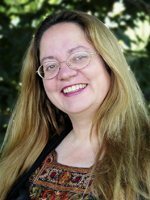 . .
Patricia Briggs: Right, if I could write a book a month, then I wouldn’t mind putting cliff hangers in, but since I can’t write a book a month, I don’t believe in doing that to my fans. I think that’s really crummy, to give them part of a story and say, “Hey! You have to wait a whole year!” [laughs] I don’t like it when writers do that to me. And so I don’t do that to them. Patricia Briggs: And so maybe that has skewed my thinking too, because I’m always writing as if, “If this is the last book I write, am I going to leave people unhappy?” and I don’t want to do that. Matthew Peterson: Yeah. Well, Silver Borne, that’s your next one, right? That one’s coming out next spring. Matthew Peterson: Tell us a little bit about Silver Borne. What can we expect with that one? Patricia Briggs: Silver Borne focuses a little bit off Samuel, who is her ex-boyfriend who is living with her and has some problems, and he’s been getting gradually worse and worse through the series. And this is the book in which I’m going to take him out and torment him terribly, because that’s the only way [laughs] to resolve his issues, and see what happens. And so this is Samuel’s book, I’ve been telling people. But there’s some other issues going on too. Patricia Briggs: Mercy borrowed a book from a friend in Iron Kissed and she’s returning it, and it’s going to cause her a lot more trouble than she’s expecting to. So this one has a lot more werewolves and fae in it than the previous book, which is kind of focused on the vampires. Matthew Peterson: And your Alpha and Omega series is kind of like a spin off, right? A break off from the Mercy Thompson series. Patricia Briggs: Yeah, that’s based on Samuel’s brother, Charles, who’s also one of the Marrok’s sons. And his mate and their trials and tribulations, and it’s different in several ways. I write the Mercy books in first person, as if Mercy herself is writing the books, and the Alpha and Omega series is in third person which allows me a little more leeway. I can do a little more head popping. I can do a little more insight into why people are acting the way they are. It also makes the two series feel very different, which I like. One of the problems with writing two series is that all of your characters really ultimately come from inside you. And so, to a certain extent, they’re going to have the kind of same feel. And I don’t want two series going where people say, “Well, it’s just the same characters under different names.” And by switching to third person, I’m sure that doesn’t happen. Matthew Peterson: Yeah, yeah. ‘Cause it’s a very different feel when you go from first to third. Matthew Peterson: I was going to say that you’ve been writing for a long time, and like a lot of authors, you did struggle at the first, but you’ve really seen some success now, and you’re getting a chance that most authors don’t get and that’s a chance to re-work your very first book so it can be published again. I heard that. Is this true? Matthew Peterson: About Masques, huh? Patricia Briggs: Because they can’t find it anywhere. Matthew Peterson: A lot of authors don’t get a chance to go back and re-work one of their first novels. ‘Cause usually first novels, you know, you’re still learning how to write a novel; it’s your first novel. Matthew Peterson: But, I mean, you have gotten a lot of the base work done, so are you making some major changes, like hacking out characters and chapters, or . . . ? Patricia Briggs: What I’m doing is I’m going to tell exactly the same story but do it better. Going through the book, I can tell you I have conversations that don’t go anywhere. I have scenes that don’t do things. I have the start of doing one thing and end up doing another. You know, things that aren’t filled out that really needed to be filled out. And I’m going to put, essentially, a little novella on the front of Masques . . .
Patricia Briggs: It’s physically painful to do that. So it’s really awesome to get a chance to re-work it. And I’m looking forward to it. Matthew Peterson: I was really fortunate with my book. Like your book, my first book is difficult to find, but fortunately I was lucky that audible.com picked it up and so the audio book and the ebook is still there, so it’s still available, but the real physical one in your hand is like an impossible thing to find. So I think that’s an exciting thing that you get a chance to do that. Patricia Briggs: It is really awesome. Yes. Matthew Peterson: Well, that’s exciting. I’ve been speaking with Patricia Briggs #1 New York Times best-selling author of the Mercy Thompson series and the Alpha and Omega series. Hopefully we’ll see Masques and Wolfsbane next year. Thank you so much for being on the show today, Patty. Patricia Briggs: Thank you so much for having me. Matthew Peterson: You can listen to the bonus questions at www.TheAuthorHour.com. Stick around. I’ve still got Kelley Armstrong and Charles de Lint coming up next.